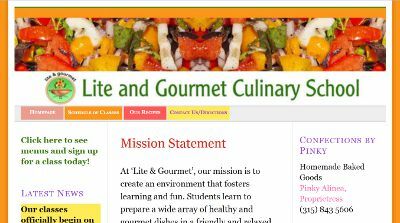 Raji at Lite and Gourmet Culinary School gave us the go ahead last Friday to fully re-create their website. They did send out a list of requirements to us and that was to have the site made in WordPress and to setup the site to be as close to identical to the previous website. The previous website had some trouble with spanning the header graphic and a few other items that were caused by the WordPress theme that were used. Therefore, we re-created the site using a different WordPress theme and corrected all of the issues that the previous site had. Raji has appreciated our support and timeliness of replies. They received a note from a customer one evening about some confusion regarding the classes and payment buttons. Raji called and we took care of the problem at 7:30 pm at night – showing that we are here to support our customers. We appreciate the additional business from Lite and Gourmet Culinary School and would be happy to help out with any other needs in the future. Dexter – the owner at Stay Ready – was a customer of ours about a year and a half ago. We put together a website for his male supplement business for a very reasonable cost. The website was up and running for just about a year when it was decided to discontinue the website. Just recently, Dexter contact us to inquire about what it would cost to set the site back up. We let him know that our cost to restore the website would simply be $25 in addition to getting a domain name and website hosting. Dexter paid his invoice today – and we had his new domain name, website hosting, and website restored within the hour. We want to thank Dexter for restoring his website and choosing to come back to us for his website service needs. 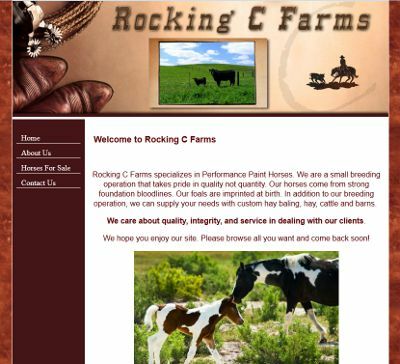 Deborah from Rocking C Farms contacted us regarding some website needs. She was referred to us by another customer. Both customers originally had their website hosted and created with another company, but because of reliability issues and the inability to update their own websites, both of them turned to us for their needs. With their other hosting provider, their website would just stop working – so their site was down. They then had to call into the provider and ask why the site was down. While they were able to get the site back up quickly, the customers had to constantly watch their site to see when it would be down. Therefore, we duplicated the site for Deborah and put it in our Content Management System (CMS) so that she can go in and update her own website. We’re happy to have helped Deborah with making a website that she is in control of – and happy to help provide much more reliable website hosting services. 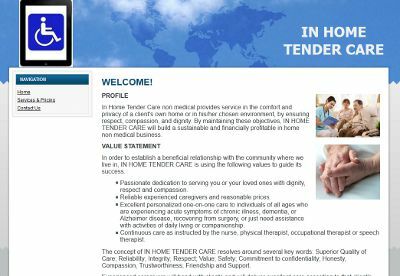 A representative for In Home Tender Care contacted us a few weeks back to make a website. Initially, they inquired several months ago to see about pricing. After getting some other bids from web designers, they chose BsnTech Networks to create the website for their non-medical care business. We got started on the website right away and were done within two business days. In Home Tender Care just let us know today that the site is “a go” and that it was what they were looking for. In the future, In Home Tender Care may add additional functionality or pages to the site, but they are pleased with the site and the low cost, affordable website design that we provided. 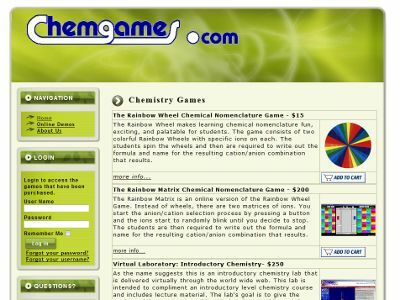 Joseph – the owner of ChemGames – contacted us a few weeks back about some issues with his current site that he had since 2002. An attacker go into his website and caused some damage – and he wanted to have our help with updating the website to new website standards and to bring it up-to-date. Within a few weeks of communications and set-up, we were able to give his website a fresh look – while inplementing a new username and password login system to provide access to his online chemistry games and labs. Joseph was exceptionally pleased with our fast turn-around time, how quick we were to respond to his questions, and taking his needs and integrating it with a new site and the games. We are now the sole website service provider for ChemGames – from website design, website hosting, and fully domain name management services. Thank you Joseph for entrusting us with your website service needs! It is an absolute compliment when you are contacted by another website design firm for help. 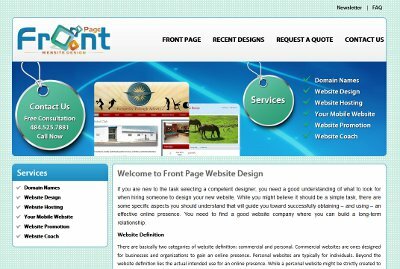 We were contacted by Ted of Front Page Website Design today and he was looking for some help with his WordPress website. After we understood what Ted was needing, we went to work right away and had resolution to his problems on the same day. Ted needed to have some cascading style sheet (CSS) modifications done to his website. He also needed to find out the font size and font type that was being used by default on the website. We appreciate the business that Ted with Front Page Website Design provided us – and hopefully if there are any other issues he has with his site or others he is making for customers, he will keep us in mind for any other website design assistance. 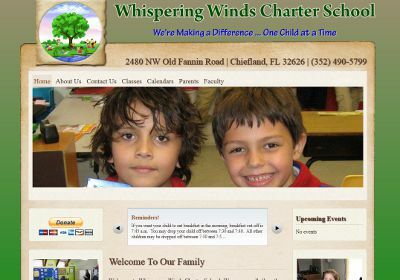 J. S. Cornell at Whispering Winds Charter School in Chiefland, FL contacted us a few years ago to create a website for them. They were exceptionally pleased and were one of our greatest customers that help spread the word about our affordable website design services from BsnTech Networks. Each of their instructors even went to our site and Liked us on Facebook. They were just extremely pleased with the website design work we completed for them – and how we were able to give them exactly what they were looking for in the way of design. Whispering Winds then employed our graphic designer to create a logo. They somewhat had apprehension about us creating a logo – because they employed a few other logo designers in the past and they didn’t create what they were looking for. However, we did let them know that nothing would be required up-front for the logo design since they had us create a sizable website – and they would only pay if they wanted to purchase the logo. Again, our graphic designer hit the nail right on the head with what they wanted. They had us fully vectorize the logo so they could use it on T-Shirts, letterheads, and more. Whispering Winds has continued to return to us to manage and take care of their website. Just today, they had us do a few more updates and decided to change over to us for their entire online presence. We took care of transferring their website over to our redundant website hosting servers and transferred over their domain names so that way everything is seamlessly managed by BsnTech Networks and combined on one invoice through then. We appreciate the extra business and the continued rave reviews from Whispering Winds Charter School! Raji from Lite and Gourmet Culinary School contacted us a few days ago about some problems with their WordPress site. They had another web developer create the site and Raji mentioned that they paid a “sizable” amount for the website design. Raji noted that they were having an open house today, on Wednesday August 21st and they needed the website fixed by then. I spoke with Raji yesterday evening and they approved of the costs to have us fix the design issues. Within two hours – and even on the same night, we worked late to get the website working as it should. The PayPal Integration on the Classes page was not working properly – and some of the classes were even missing. We worked quickly to get this website maintenance work completed. In addition, the navigation bar under their header graphic was missing. The previous web developer was able to get it to work sometimes – and not other times. We uncovered the problems with the menu and got it to be restored. Raji was exceptionally please with our fast response to their concerns and our affordable website design rates. 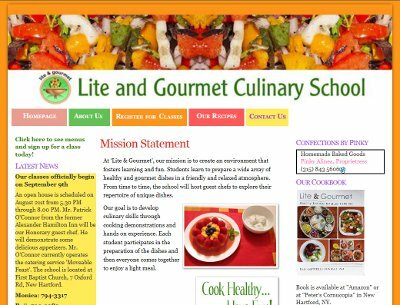 In the future, Lite and Gourmet Culinary School may have us fully create a new website for them since the design theme that the previous web developer used has some programming problems that cause the site to look differently in other web browsers. 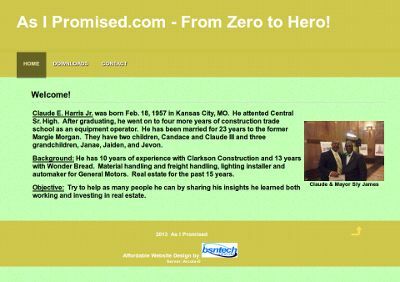 Affordable Website Design For Claude H.
BsnTech Networks was contacted about a month ago from Claude H. He was looking to make a website where he could sell his informational and guidance materials online. Claude has worked in many different occupations and has experience with real estate. We went to work for Claude right away after understanding the needs for his site. Once the information and documentation was received, we had the site done in a week! Claude was very happy with the results and how fast we were to respond to his questions and updates. Another satisfied, affordable website design customer for BsnTech! Ms. Evette contacted us a few weeks ago about her interest in having a website created. After several phone conversations with her, we explained everything completely to her. She later discovered that she had two websites online already – but had no idea who had created them, where they were hosted, and whether or not they would expire when the domain names expire in less than a year. In other words, she had two previous website designers that have lost contact with her and haven’t provided any support or information regarding her websites. After working with Ms. Evette over the phone, she was completely pleased with our response and how well we explained everything to her. She opted to go with the route of having us host her website, get a new domain name for her, and then make a copy of one of her existing websites and put it online for her. She was concerned about her losing her website, so we did our best to preserve it. This also saved her considerable cost as well. 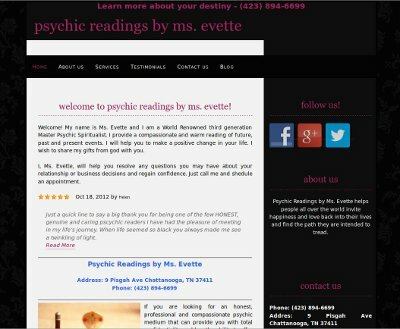 Instead of creating a new psychic website design for her, we simply made a copy of the one she already had and set it up. She was very cost conscious and wanted to keep the costs as low as possible. We had Ms. Evette’s payment taken and her website copied and fully online within two hours of each other! When we get an order for website services, we work as quickly as possible to ensure complete customer satisfaction. Ms. Evette was so pleased that she has already gave out our information to a few of her contacts and let them know to contact us if they need any kind of affordable website design!